Here is an interesting chart by Peter Garnry, an Equity Strategist at Saxo Bank in Denmark. 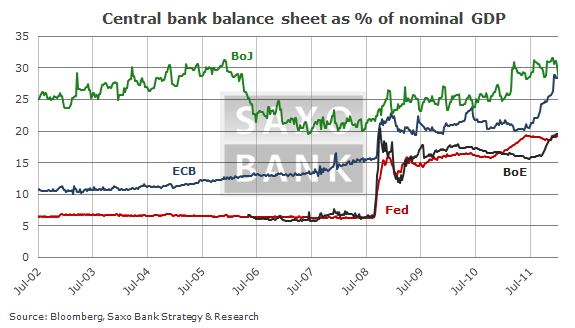 The race is on to see which central bank can load up its balance sheet with the most garbage the fastest. Lemme see here, the EFSF was, once upon a time, going to lever itself up by taking the first 20% of losses on PIIGS sovereign bonds. This would give it the 'firepower' to quell the crisis in the Eurozone. How laughable that now seems. Such an arrangement would not even protect the ECB's 'investment' . Instead we hear rumors of schemes to foist the ECB's holdings off onto the EFSF with the ECB's 30% haircut already attached. So now, if I get this right, the EFSF is now the bailout mechanism for the ECB's SMP and that the PSI must now be broadened to become the PPSI or Public Private Sector Involvement and ESM is to be readied by this summer to take the place of the EFSF . And all of this just to deal with Greece. Given the failed bailouts, collapsed arrangement, lies, violations of EU law, summits, press conferences can Merkel, Sarkozy, Barroso and Rehn cobble together only to have fall apart before everyone realizes the jig is up? That they have no solution because there is no solution. The system is bankrupt. The system is indeed morally and mathematically bankrupt. Some points above may not be perfectly accurate in entirety but the idea conveyed is certainly accurate. The key question is "when does everyone realize the jig is up?"